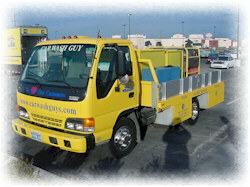 WashGuys are making available two used Car Wash Guys Truck Units for expanding or newly formed franchises. We see an increase in business with the changes in weather. It is for this reason we are sending two units to the fleet for continuation of service rather than removal of equipment and selling of trucks. We also have financing available on these units for our team. One unit we are pulling off the line and making available is a 45,000 mile NPR Isuzu 1999, $35,000 with brand new transmission (complete unit). The other is a Dual Cab single machine on a 2002 NPR Diesel Truck "Global Annihilator Series Truck" with 28,000 miles on it. Both are working now and ready to start.